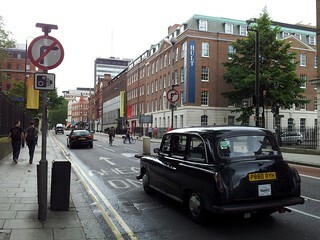 On Saturday 7th July 2012, Alex Santacreu led our sixth inspection ride round the Holborn area. DRAFT. Saturday 7 July 2012. A group of 5 cyclists inspected the Holborn area: Steve Cardno, Meade McCloughan, George Coulouris, Jean Dollimore and Alex Santacreu. We started outside the Renoir Cinema, looking first at the Brunswick Roundabout and then went to inspect the routes described below. 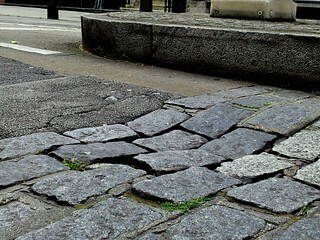 We discussed the Brunswick Square roundabout which Camden Council is planning to remove and replace with a cross roads. 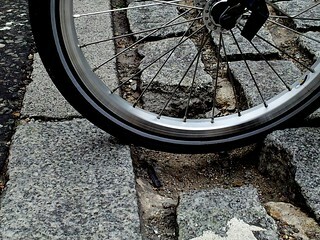 Riders agreed this would be a great urban realm enhancement, especially benefitting pedestrians and cyclists. This is also an opportunity to close Lansdwone Terrace to motor vehicles, allowing two-way traffic on Grenville Street, turning the present roundabout into a simple T-junction. We moved on to explore the routes connecting Camden (from the British Library) to Southwark or the City. 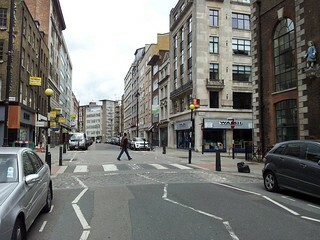 All the routes described below join on Hatton Garden, a two-way commercial street with effective traffic calming. See the photo on the right. 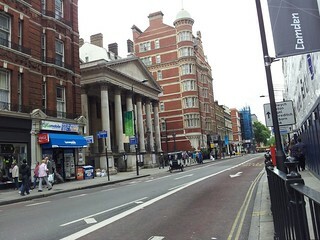 The routes go through Holborn Circus, offering a simple connection to St Paul’s via Holborn viaduct or Blackfriars Bridge via Shoe Lane. 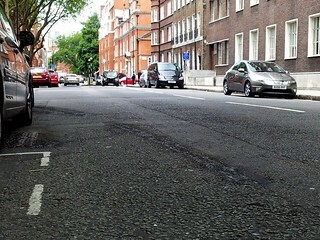 Camden Cyclists are currently working with the Council to make sure these important cycle routes are maintained in the planned simplified layout of Holborn Circus. In these plans, the southern end of Hatton Garden is to be one way northbound and it is essential that contraflow cycling be provided. 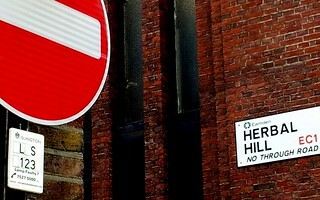 Herban Hill, going south from Warner Street. 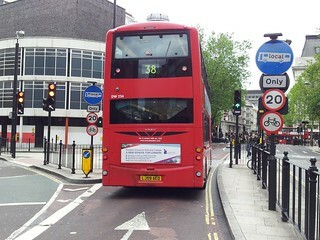 Do we need three lanes of traffic on Clerkenwell road westbound? 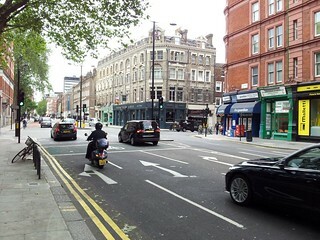 Is there a good reason to ban the cyclist’s right turn into John Street which is needed to follow the route via Doughty Street? 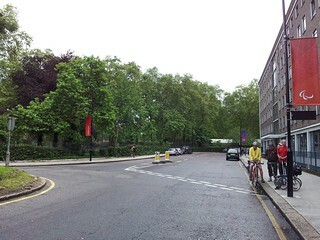 This route avoids the main junctions on Gray’s Inn Road and is not as hilly as the Phoenix Place route. However, it isn’t complete until Laystall Street allows 2-way cycling along its entire stretch (i.e. both north and south of Rosebery Avenue). 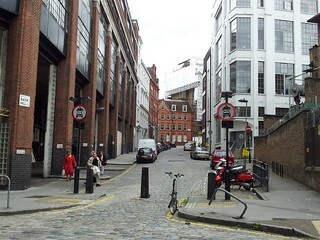 This route follows Guilford Street, Doughty Street, Roger Street, Elm Street, Laystall Street, Clerkenwell, Hatton Garden, and St Brides Street, emerging into Farringdon Road through a cycle path across footway: another gap is provided in the central reservation on Farringdon Road. Roger Street is one way eastbound but the return can currently be made via Northington Street. It may be worth revisiting a case for two way cycling in Roger Street. 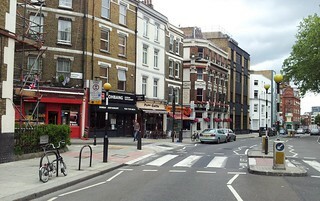 Laystall Street is one-way southbound between Mount Pleasant and Rosebery Avenue; and one-way northbound between Clerkenwell Road and Rosebery Avenue. Two-way cycling for the entire length of Laystall Street would enable a useful route for cyclists. 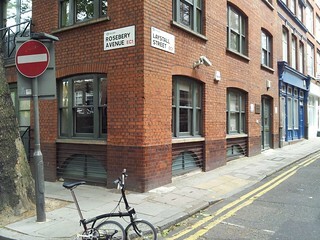 The entry to Laystall Street at Clerkenwell Road is marked with a ‘flying motorcycle’ sign (allowing cycle access) and described as a pedestrian zone Monday – Friday 8:30 and – 4.30 pm. 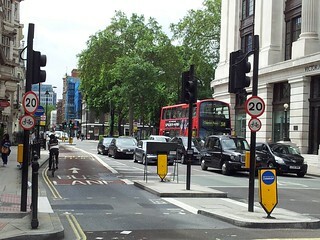 The route for eastbound cyclists on Theobalds Road via the Holborn one way system requires a left turn into Proctor Street and then a right turn into High Holborn. This involves crossing several lanes of moving traffic to enter the bus lane on the right of Proctor Street. You then have to get across High Holborn and decide on a suitable road position for proceeding straight ahead on this 4-lane one way street. The junction at Kingsway is very wide and you have to find a place in a much narrower street on the far side. Sidmouth Street forms part of the main east-west cycle route through Camden and is heavily used by cyclists: they deserved a better surface. Elm Street is on Route 3 described above. Before the planned inspection, we considered the recent changes in Hunter street. 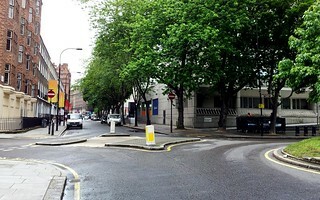 (As part of a scheme to provide signage on a default north-south route from Judd Street via Hunter Street, Guilford Street, Lambs Conduit Street and Red Lion Street. In Hunter Street, there had been some sub-standard cycle lanes on both sides of the road: they were too narrow, not continuous and some were in the door zone. 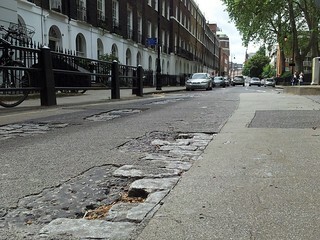 It was decided to remove these and to enhance a long northbound feeder lane as far as Tavistock Place. The group approved these changes.